Happy Monday to everyone, its back to the grind for some and not for others. I hope every one had a wonderful weekend. I personally had a pretty good one, didnt have too much planned. Saturday I had to take my 6 year old daughter to her ice skating lessons , she actually did really good ! Then i had to work Sunday. So I did manage to make it to Jo Ann's Saturday ....they were having a really good sale, plus I had a coupon!! I found a really great fabric to make Gracie a pillowcase outfit for the spring. I can not wait to make it !! I will be taking orders for this print. I think you all will love it ! I am gonna be posting a few new projects that I have done over the past week. I have made a couple of hair bow and clippie holders. I have made a few hair bows this past week. I have also made a pillowcase outfit for my cousins little girl like the one I have posted, cant wait to get a picture of her with it on. Well happy monday to every one agian and I hope everyone has a wonderful and blessed week. Hi, I am Tiffany. I started Elaina Grace's in September of 2009 when i was on manternity leave with my son, but what really started it all was when i saw a pillowcase dress online. I shopped around for a few weeks and then i told myself instead of buying them for my 6 year old daughter i would just bring out the sewing machine and make my own. I fell in love with making pillowcase dresses right away. I am always thinking about what i can create next. 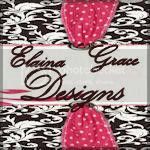 I also love to make boutique hairbows and clippes.Please stay tuned for new things to come !